Cook the Tur Dal to 3-4 whistles (may change as per your cooker) in a pressure cooker. The dal should be soft. In a pan add the grated tomatoes, water, tamarind paste, Jaggery, Sambhar Masala, green chillies (Adding chillies at this stage will make it spicy, so can add later if spice level has to be less). Water consistency should be as required. 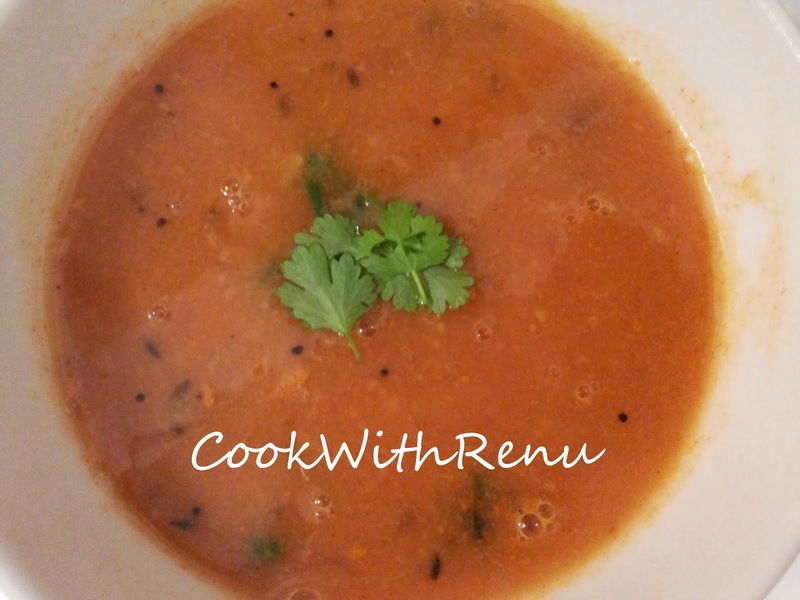 If you require Rasam add more water, if Sambhar a little less. Let it boil for atleast 10-15 minutes until the raw smell of tamarind is gone. In the meanwhile smothen the tur dal to make a semi soft kind of consistency. The Dal pieces should ideally not be there or should not be too much. Once the water has boiled enough add the dal mixture in it. In a small kadai or wok, add ghee. Once hot add hing and mustard seeds, and Jeera. Once that crackles add curry leaves and Red chilly. Add this to the dal and tomatoes mixture. Now add the turmeric, red mirchi, salt and let it boil. Once froth starts coming in switch off the gas. The taste should be a little sweet and tangy, so if required you can add jaggery or lemon accordingly. I said lemon here as this is after it gets cooked and when you are finalising it. Add the chopped corainder and serve it hot with Idli/Dosa/Medu vada or simple Rice.